Let's go to another most authentic Indian restaurants in town, followed by a visit to a cooking studio to learn what we ate. According to me Protected content is quite an authentic Indian restaurant for some particular Indian dishes. So, Let's go to Protected content for dinner on Saturday, 2nd February Protected content . 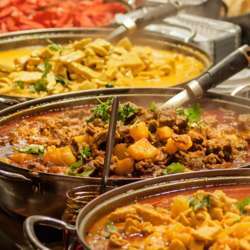 We will meet inside the restaurant around 18:00 and enjoy the authentic Indian Cuisines for one and half hour, Around 19:30 (Flexible to the mood of the group) we will move from the restaurant to a cooking studio to learn what we eat. I am looking forward to seeing you all on Saturday 2nd February.